One of my favourite parts of past roles has been being involved in hiring. It’s exciting to be part of the process of building a team, and is also great experience when it comes to knowing how to improve your resume and interview skills when you’re on the other side of the table. Over the past 15 or so years, I’ve reviewed tons of resumes. Some stand out and make you want to meet the candidate immediately. Others are confusing and leave you with more questions than answers. And others have omissions or errors that make you immediately throw it in the “no” pile. So in today’s post, I’ll be sharing 5 simple ways to improve your resume. These are strategies to help you show up as your best self and better your chances of getting an interview. #1. Tailor it to the job at hand. It can be tempting to just grab the latest version of your resume and use it when applying to any job. But not taking the time to tailor it to each opportunity could be a missed chance to stand out. You see, even if your skills and experience could lend themselves to a variety of roles, there are aspects of your background that apply more or less, depending on the opportunity. For example, if you have experience in both sales and marketing, you may want to have a more sales-focused resume for applying for sales jobs, and a more marketing-focused resume for applying for marketing roles. These resumes would differ in that they would expand on and play up your experience in the area you’re looking to focus on. Both resumes are accurate. But they each highlight different experience to showcase why you’d be a great fit for a role in that area. If you want to take this a step further, you can update your resume to include keywords that are relevant to the specific job you’re applying for. For example, if the job posting mentions “teamwork” and “collaboration” numerous times, look to include those words in your resume. Are there times you were recognized for being a strong team player? Or projects that involved a lot of collaboration? Dial that up. 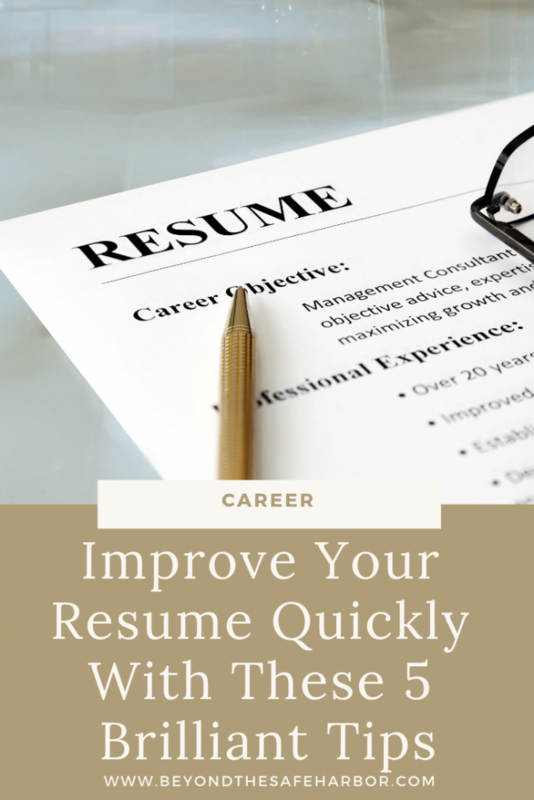 In many cases, companies are scanning resumes (either manually or using software) for key words and phrases, so the more your resume aligns with them, the better your chances of getting an interview. Something I’ve seen in the past with many resumes is that they read like job descriptions. Instead of highlighting the unique impact the individual had, they are a summary of their responsibilities. This downplays their results and makes it hard for potential employers to understand your performance as an individual. Managed all new product innovation for X brand. Launched 5 new products each year for X brand, resulting in +15% revenue growth year over year. Which one is more compelling? The second statement quantifies the work the candidate did as well as the result. Whereas the first statement reads like a job responsibility that could have been done poorly or incredibly – there’s no way of knowing from that statement alone. #3. Quantify whatever you can. As we saw in the example above, adding numbers and figures is powerful. It helps quantify the work you did and the results you achieved. For each bullet point on your resume, look to see if there are ways to quantify it. Awarded X award, given to the top 25 applicants to the program. Successfully led a team of 5 individuals. Managed a budget of $3.5MM. Some of those aren’t yet framed in a results-like way (they still sound more like job descriptors), but they can be woven in with results and other statements to bolster them. Many organizations appreciate people who are well-rounded and have an interest in giving back to the community. Include any recent volunteer work, even if it’s in an area outside that of the job you’re applying for. It shows more sides of you as a candidate and can also be a great conversation starter. Plus, you likely gain skills and experience from volunteering that could be applied to a work environment. Examples can include acting as a mentor, or volunteering at a local non-profit organization. You may also wish to include any side hustles or businesses you run as this speaks to your ability to manage your time, having multiple interests, and acts as a conversation-starter. #5. Proofread it more than once. A simple spelling error or grammatical mistake may be enough to turn off a potential employer. Before sending or submitting your resume, proof read it several times. You may also want to have a friend or family member take a look at it. As you’re proofreading it, also look for opportunities to make it more legible. Is the font large enough? Is there enough spacing between lines? Is it easy to read? Those are my best tips for quickly taking your resume to the next level. With some strategic tweaks, you can set yourself up for success and improve your chances of getting an interview. Do you have other advice for writing a killer resume? I’d love to hear them! Let me know in the Comments below.